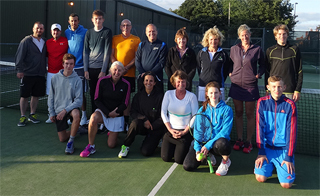 Wednesday night is Social Tennis night at the Club. Organised mixed double play between 7-9pm. This happens every Wednesday except bank holidays. A small fee is charged. Non members are welcome to attend 3 times at a cost of £5 a visit. The bar is open and this is a good opportunity to meet new people. Ladies Morning takes place on Monday mornings during school term time between 10.00 and 11.30am. Non members are welcome.